This article is obsolete. AxDB is no longer available in Dynamics 365 for Finance and Operations production environments. 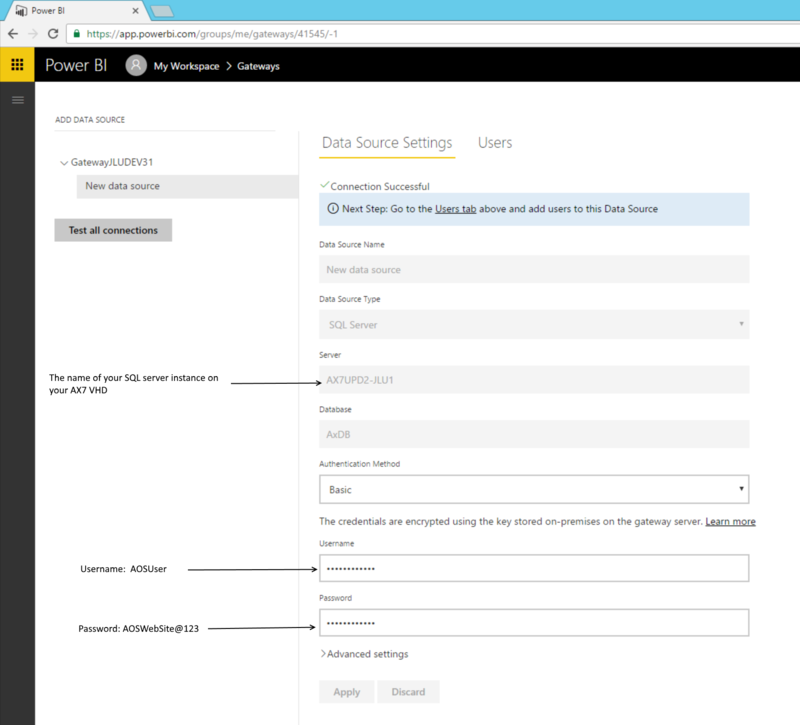 Currently application developers have either the option of using AxDW (the data warehousing database) which is available via Power BI embedded or use the BYODB approach. Step 1. 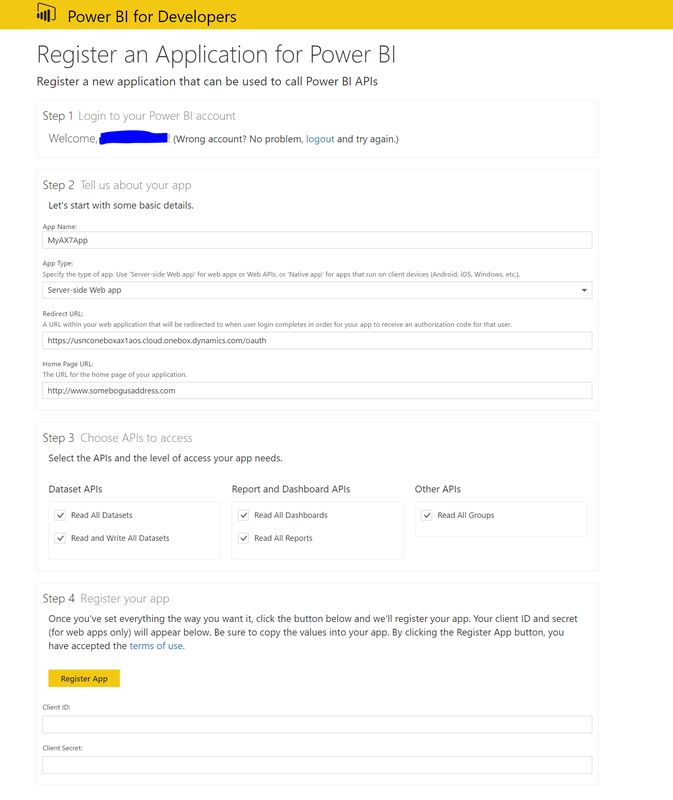 Create your PowerBI account. 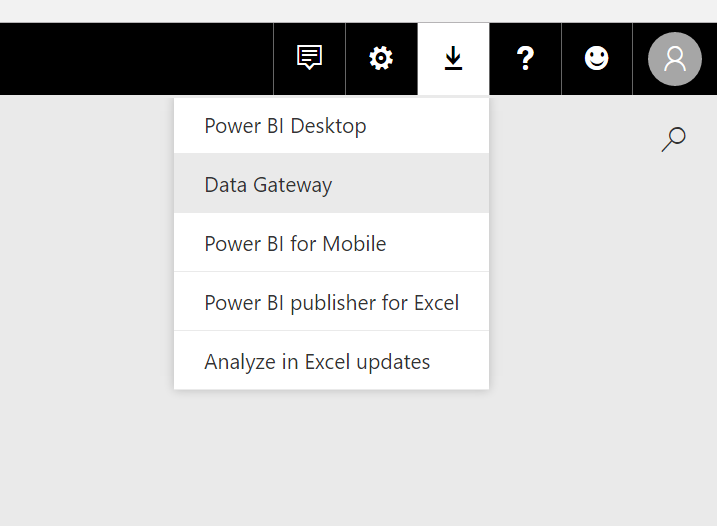 Go to http://www.powerbi.com click on the "Get started free" button. Follow the on screen instructions. Step 2. Register your application with PowerBI. Choose "server-side Web app", in the redirect URL type: https://usnconeboxax1aos.cloud.onebox.dynamics.com/oauth and the Home Page URL can be any bogus URL. Once you click on the Register App Button you will get a ClientID and a Client Secret. Write those two down, they are required by the AX7 PowerBI configuration screen. Step 3. 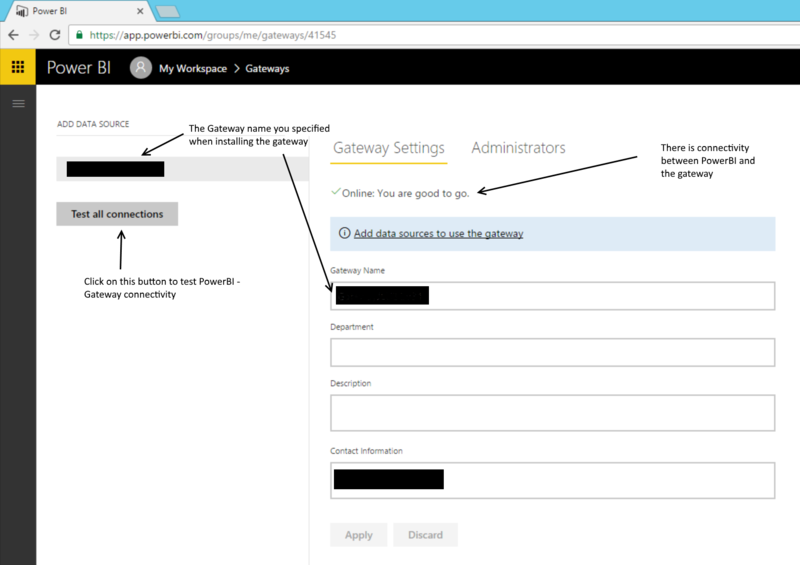 Install the local PowerBI gateway on the AX7 VHD. 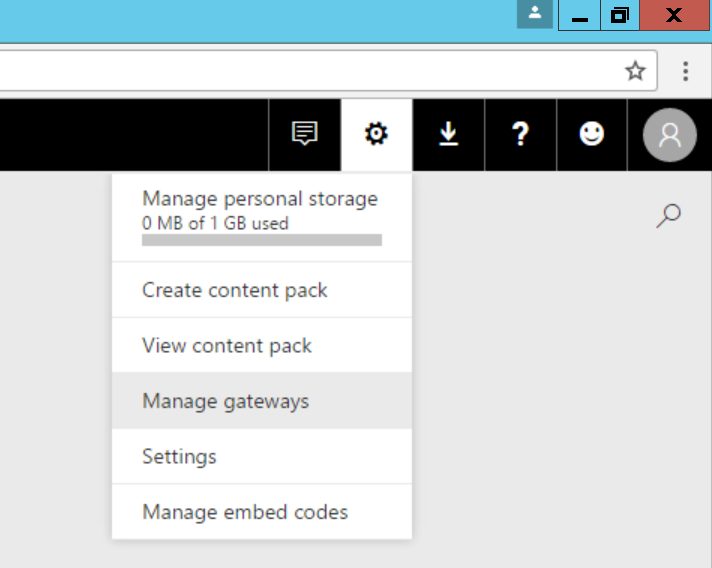 When installing the gateway choose the "on premises data gateway" option. You will then be asked to log in to the PowerBI account you've created in Step 1. You will be prompted to name your gateway and create a gateway recovery key. 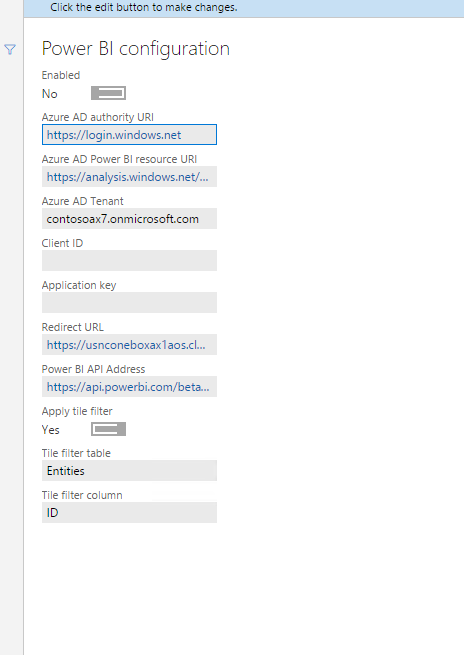 Change the Azure ID tenant to your tenant eg: somecompany.onmicrosoft.com. The Client ID is the client ID you got in Step 2, and the application key is the client secret. Log into your PowerBI account. Click on the gear icon and then on "Manage Gateways". Click on the "Test all connections" button. If the gateway computer is turned on the screen should display the "Online: you are good to go" message. Step 6. Add a data source to the gateway. Click on the "Add data sources to use the gateway link". Use the AOSUser/AOSWebSite@123 username/password combination.